During lunch, I had accompanied my wife to Taman Melawati, Kuala Lumpur National Registration Department(NRD) for NRIC or MyKad replacement. They are six peoples in queue and three peoples at counter. The process only take less than an hour. We can collect the MyKad next two weeks. We can collect the card at Putrajaya, NRD next 24 hours if urgently need it. NRD charged my wife RM10 for replacement. 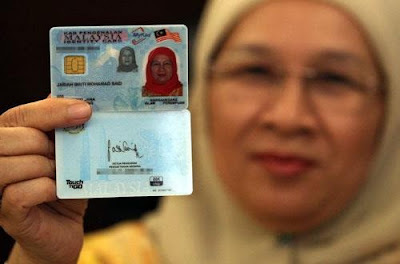 My wife want to replace her MyKad because her picture on MyKad is quiet blur and have problem when deal with bank or other personal matter which involve MyKad . She have tried apply through online but rejected because they cannot extract her image on database. This is because her picture is in old format. Last year, I managed to apply for replacement through myeg.com.my. New MyKad and she is not my wife.